Lizzy Glashoff is a farm girl through and through. As a member of 4-H and Future Farmers of America (in elementary and high school, respectively), she raised chickens, learned to cook and preserve fruit, and even took a beef cattle class — all before going to college. That might explain why, when her parents asked whether she and her older brother Jacob wanted to take over the core operations of her family’s walnut, berry, and citrus farm, Lizzy didn’t have to think very hard before saying yes. Last year, Lizzy’s dad, Larry Glashoff, was offered a job working with small farmers in rural China, and his wife Maria decided to accompany him for a good portion of the year. They considered leasing out their property and letting go of the farm, but their adult children have agreed to run Glashoff Farms in their absence. “I’m putting in around 100% more effort,” says Lizzy, who went from helping out with marketing and farmers markets to essentially co-running the business. She does the farm’s books, supervises eight employees throughout the fruit and nut harvests, and oversees production of the value-added products like jam, jelly, and walnut oil. Meanwhile, her older Jacob has “been in charge of the mechanical side of things, and any fertilizers and spraying that needs to get done,” she says. Their second brother, Lucas, staffs market booths when he’s not in Southern California attending film school. “I never really had a rebellious phase,” says Lizzy, who has lived on or near the farm for most of her 26 years (minus four years in Chico in school and a semester in Italy). She’s interested in carrying on the business, in part, because she realizes just how rare farms like her family’s have become. And while much of the farmland around them in the Suisun Valley is protected by land conservation incentives, she sees development encroaching. “I love what we do. It’s not always the easiest thing, but it’s what we’ve always done and it would break my heart if we weren’t farming anymore,” she says. Of course, conveying the family’s core values to farmer markets sales staff (many of whom aren’t likely to see the job as a major career move) can be tough. “The biggest trouble my mom and I have had is really getting our employees emotionally invested in our company,” says Lizzy. Toward that effort, she likes to make sure each employee gets to see the farm from the inside out; she shows them “how much labor it requires and how much care is taken in every process.” The Glashoff preserves, for example, are made with four parts of fruit to every one part of sugar, rather than the one-to-one ratio that is commonly used. And when she says we, Lizzy means it. 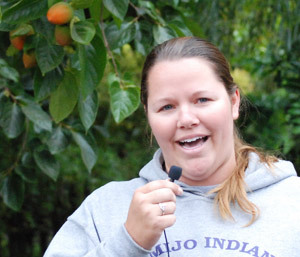 Her ultimate goal is to incorporate her undergraduate degree in event planning into her work on the farm by hosting on-farm weddings that would allow more people to appreciate the land she knows and loves. But, for now, with her parents gone so much of the time, she’s just awfully busy keeping the farm going. 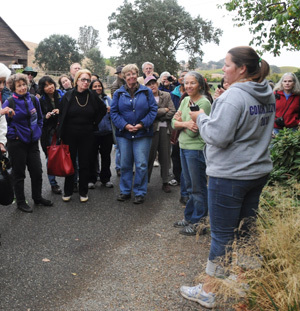 Photos of the CUESA Farm tour to Glashoff Farms by Barry Jan.